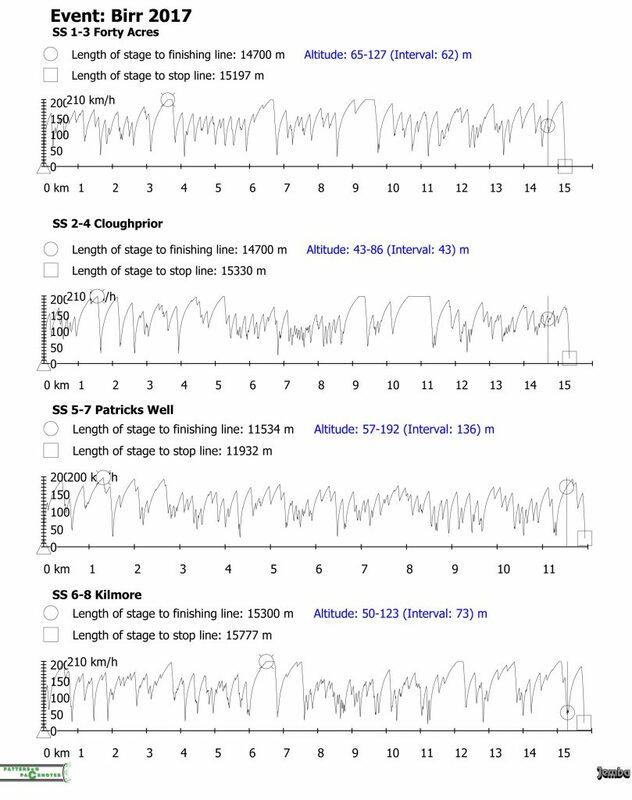 Birr Stages – Sample Video & Data – RallyNews – Patterson Pacenotes Extra's….. The Triton Showers 2017 National Rally Championship gets underway next week with the season opener Birr Stages Rally. It has always been a little bit of a misnomer when the rally has been called The Birr Stages. Organised by the Birr and district motor club, the rally has moved around a little bit over the years, and this year, it returns to one of its more traditional bases, and will have its headquarters at the Abbey Hotel in Nenagh. This year the event will consist of a 4×2 with two stages to the north east of Nenagh and two stages to the south-west. The morning stages are fundamentally fast and flowing while the afternoon stages are equally as fast and flowing they have a little bit more technicality involved. It will be a challenging start to the season, with something for all the competitors. Below we have included some technical data including the speed traces from each stage Plus a small sample video.